Manchester City had to settle for second place yet again after Liverpool won their match against Chelsea later in the day. Manchester City cruised to yet another victory, their ninth on the trout, as they dismantled Crystal Palace, barring a nervy 10 minutes that saw Luka Milivojevic scoring one for Palace and putting City on the back foot. 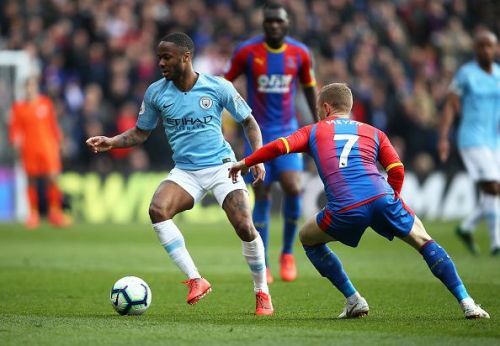 In a comfortable afternoon, Raheem Sterling opened the account in the 15th minute after a brilliant ball from Kevin De Bruyne opened up the Palace defence. The winger doubled it up in the 63rd minute after Sane found an unmarked Sterling at the far post. A nervy 9 minutes followed City after Luka Milivojevic scored one from a free kick in the 81st minute, but a 90th-minute goal from Gabriel Jesus buried the tie in favour of the Citizens handing a single point lead over Liverpool before the Merseysiders defeated Chelsea later in the afternoon. This has been one of the greatest Premier League races of recent times. The victory against Crystal Palace followed by a win from the Reds against Chelsea saw the leader at the top of the table exchanged for the umpteenth time this season. With just a few matches remaining in the EPL, the Cityzens are in pole position to defend their title against Liverpool, provided that they win their remaining matches. But Pep Guardiola and his men will need to face Tottenham Hotspur at home and arch-rivals Manchester United away in their last 5 remaining matches while Liverpool has an easier run of matches as compared to the defending champions. Liverpool lead the title race with two points over Manchester City after their victory against Chelsea later on Sunday but have a played a game more than Guardiola's side.